Removable Inserts to be ordered separately with your Essential Oil Wallet order. These inserts are made from genuine Leather and have Genuine VELCRO® Brand Hook on the back and Woven Elastic loops on the front. Simply select the correct Insert for the combination of Essential Oil Bottles that you wish to carry in your wallet, fit your bottles into the insert and then place into wallet. 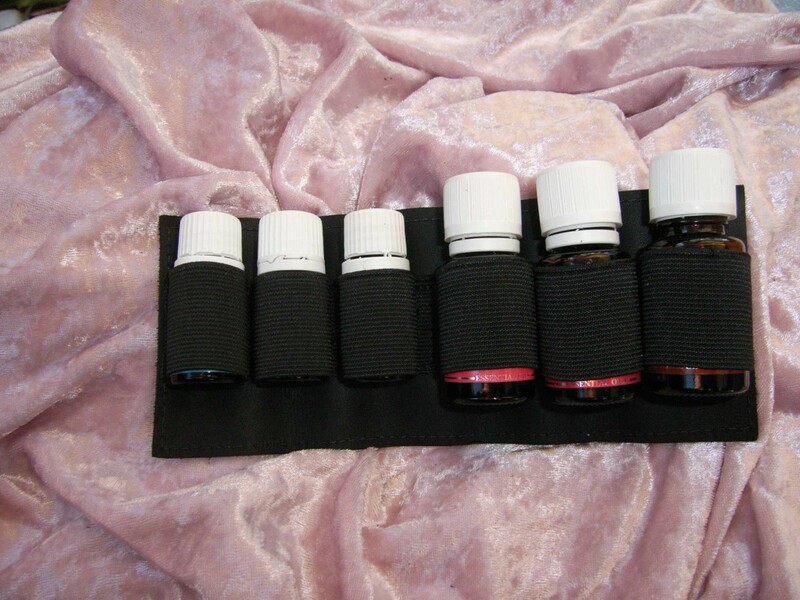 Many People order more than one insert for their Essential Oil Wallets, as they can alter the sizes and combinations of the bottles that they wish to carry at varying times. Rollon Small - Fits 3 x 5 ml Essential Oil Bottles upright and 3 Rollons Sideways. Use the Bottle Sox (available separately to obtain a snug fit) these loops can also be used for 5 ml Bottles. Rollon Large- Fits 3 x 15 ml Essential Oil Bottles upright and 3 Rollons Sideways. Use the Bottle Sox (available separately to obtain a snug fit) these loops can also be used for 5 ml Bottles. This Wallet and insert is great! I carry my essential oils with me everywhere I go, and I was so sick of rummaging through my huge handbag trying to find my oils all the time. Gerry Congratulations on your brilliant design! I love it! I love the smell of the real leather too! WOW a wallet that has interchangeable inserts has made my life easier as I can decide which oils to carry with me at the time and have the appropriate insert ready to pop into my Essential Oil Wallet. I purchased 3 different inserts and love them! Click the button below to add the Interchangeable Inserts/Essential Oils Wallet (Part B) to your wish list.